HONG KONG, Apr, 03 2019 - (ACN Newswire) - April is one of the peak seasons in Hong Kong for exhibitions and sourcing, with the Hong Kong Trade Development Council (HKTDC) presenting four major international trade fairs in the latter half of the month. The HKTDC Hong Kong Houseware Fair and HKTDC Hong Kong International Home Textiles and Furnishings Fair will be held from 20 to 23 April at the Hong Kong Convention and Exhibition Centre (HKCEC). They will be followed on 27-30 April by the HKTDC Hong Kong Gifts & Premium Fair, also held at the HKCEC, and the Hong Kong International Printing & Packaging Fair, jointly organised with CIEC Exhibition Co (HK) Ltd and held at AsiaWorld-Expo. Some 7,400 exhibitors from 35 countries and regions will present their products and services at these signature promotion and sourcing platforms. According to figures published by research institute Statista, global revenue in the furniture and homeware segment is expected to top US$226.5 billion in 2019, with a projected annual growth rate of 10.6% until 2023. The global figure is expected to climb to US$338.3 billion by 2023, with Mainland China becoming the largest market, generating approximately US$78.7 billion. 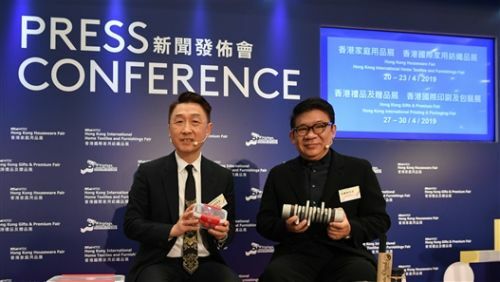 Hong Kong's exports of houseware products reached HK$351.1 billion in 2018, up 24% on the previous year, with the United States, the mainland and Japan continuing as the city's largest export markets. In the gifts and premium segment, Hong Kong's exports totalled HK$161.2 billion in 2018, up 6% on the previous year. The long and illustrious history of the Houseware Fair and Gifts & Premium Fair is a testament to Hong Kong's pivotal position in the global houseware, gifts and premiums industries. Asia's leading show of its kind, the Houseware Fair will feature 2,160 exhibitors from 27 countries and regions this year, while the concurrent Home Textiles Fair will bring together about 310 exhibitors from seven countries and regions. At the Gifts & Premium Fair, the world's largest event of its kind, a record 4,380 exhibitors from 30 countries and regions will attend. The Printing & Packaging Fair, held in parallel with the Gifts & Premium Fair, will welcome nearly 500 exhibitors from six countries and regions. In addition, the HKTDC will organise 300 buying missions, comprising more than 14,600 companies from around the world, to visit the fairs. The four fairs will offer an ideal trading platform for industry professionals looking to expand their footprint in the mainland and global markets. Innovation and technology (I&T) has been made a cornerstone of the Guangdong-Hong Kong-Macao Greater Bay Area development, and nurturing start-ups is an integral part of the process. Startup Zones have become an important element of the HKTDC's fairs. Benjamin Chau, HKTDC Deputy Executive Director, said: "The power of Asian start-ups should not be underestimated. Start-ups in Hong Kong have blossomed over the past two years. With an aim to promote entrepreneurial innovation and the sustained development of corporations, the HKTDC will continue to support start-ups and set up Startup Zones at nine of its large-scale events, including this year's Houseware Fair and Gifts & Premium Fair." During the two fairs, the HKTDC will organise multiple Startup, Smart Launch sessions at which start-ups can introduce their businesses concepts and products to industry professionals to generate more business opportunities. This year's Houseware Fair will see 28 start-ups from Hong Kong, the mainland, Indonesia and the Philippines. They include Hong Kong's SPACEPLAN, an online platform that provides one-stop interior design solutions and encourages local interior designers and young designers to launch their own businesses. At the Gifts & Premium Fair, 34 start-ups from Hong Kong, the mainland, Indonesia, the Philippines, the Netherlands and Taiwan will be on site. One Taiwanese start-up, Muherz, will introduce its Cubiio Portable Laser Engraver, the most compact device of its type which can be controlled by an app. Smart technologies are now becoming part of our daily lives. At the Houseware Fair, an exhibitor from the mainland will present its KIGI Food Storage Container. The product comes with an app that reminds consumers of the use-by date of the food in the container and will even offer recipe suggestions using that type of food as an ingredient. A Hong Kong exhibitor, meanwhile, will showcase its SmartBowl for pets, which enables owners to keep track of their pets' daily calorie consumption. At a 23 April seminar, speakers from IKEA and Euromonitor International will share their insights on trends and developments in smart and eco living. This year's Houseware Fair will continue to adopt the main theme of L.I.F.E. - representing "Lifestyle", "Interior", "Feast" and "Enrich". "Lifestyle" will cover exquisite dining, home decor and eco-friendly houseware products. "Interior" refers to elegant interior designs, and will see the debut of a Candles and Scenes zone. An array of cooking and dining tools will be featured under the "Feast" theme, while "Enrich" will spotlight such quality-of-life-enhancing products as pet supplies, baby products, gardening supplies and beauty and healthcare products. To highlight the four themes, the HKTDC has teamed up with WGSN, a world-renowned trend forecasting authority, to set up an on-site display featuring new concepts and highlighting key lifestyle and interior trends for Spring/Summer 2020. WGSN will also host a seminar to examine the upcoming colours, fabrics, shapes and moods. Multiple pavilions will dot the fairground of the Home Textiles Fair, including those presented by three of India's largest chambers of commerce for the textiles industry - the Handloom Export Promotion Council (HEPC), Export Promotion Council for Handicrafts (EPCH) and the Carpet Export Promotion Council (CEPC). The pavilions will be dedicated to showcasing fine home textiles products from across South Asia. In addition, Zhejiang, one of Mainland China's major home textiles manufacturing bases, will present two pavilions to display Zhejiang's traditional quality bedding products provided by companies from the town of Zhouquan and Pujiang county. A total of seven thematic zones will be featured at the fair, including the Hall of Glamour, Bathroom & Kitchen Textiles and Baby & Bedroom Textiles. The world's largest Gifts & Premium Fair will see the World of Beauty, Fitness & Well-being zone make its debut. The zone will feature close to 40 exhibitors from the mainland, Hong Kong, Taiwan, Korea, India and New Zealand showcasing cosmetics, skincare, health and spa products. Highlight zone the Hall of Fine Designs will display more than 140 brands from around the world, including Team Green, a Hong Kong brand that specialises in eco-friendly 3D puzzles; Kokuyo, a revered Japanese stationery brand; and Pininfarina, an Italian brand known for its creative stationery. In addition, the Hong Kong Exporters' Association, the co-organiser of the fair, will present a pavilion with three zones - Isle of Originality, Brand Oasis and Smart Design HK - featuring more than 170 quality Hong Kong gift exporters. Other pavilions include those from the mainland, Taiwan, India, Korea, Thailand and the United Kingdom. Multiple seminars will also be held during the fair, covering topics that include the new retail trends in the US and the mainland, and data-driven brand-building strategies. Held at AsiaWorld-Expo, this year's Hong Kong International Printing & Packaging Fair will feature four major thematic zones - De Luxe, Green Printing & Packaging Solutions, Printing & Packaging Solutions for Fashion & Accessories and Innovative Retail Display Solutions - and will also mark the debut of the World of Advertising and Signs zone to showcase creative visual communication and promotion approaches. An exhibitor, Hong Kong Media By Phone Co, will showcase its Droptix display panel, which can enhance displays, packaging, posters and POS (point-of-sale) items with an eye-catching 3D (three-dimensional) effect. The emphasis on corporate social responsibility in recent years has spawned an assortment of eco-friendly materials. Taiwanese exhibitor Haurtyi Paper Bag Co Ltd will display its Stone Paper Bag made using a new mineral powder that's more environmentally friendly than traditional paper. A series of seminars will also be organised during the Printing & Packaging Fair, including sessions entitled "Embrace Opportunities in Greater Bay Area: Certification and Training Services in Hong Kong's Graphic Arts Industries" and "New Development and Application of Wide Gamut Colour Printing". HKTDC Deputy Executive Director Benjamin Chau (L) and Hong Kong Exporters' Association Vice Chairman Brian Sun (R) host a press conference held by the HKTDC at Harbour City today to outline details of four upcoming trade fairs - the HKTDC Hong Kong Houseware Fair, HKTDC Hong Kong International Home Textiles and Furnishings Fair, HKTDC Hong Kong Gifts & Premium Fair and Hong Kong International Printing & Packaging Fair.